March means two things: springtime and basketball tournaments, both of which inspire hope for a better future. Here in Montana, March has brought very little springtime, but this year’s state high school basketball tournaments delivered inspiration in buckets, especially from teams hailing from Indian Country. The Wolf Point girls won their first title since 2003; the Box Elder girls won their second of back-to-back championships, and the Warrior Movement from Arlee, profiled last year in the New York Times, continued to grow as both Arlee’s boys and girls played at state. One of the most powerful stories happened even before the state tournament began, when the boys from Poplar won a thrilling divisional game in overtime on a buzzer-beating basket and then showed ultimate class by consoling the star of the losing team. But, despite the hope and unity that these teams inspired, they and other teams from tribal communities are regularly denigrated and disrespected by fans, businesses, and, worst of all, state officials. This type of March madness — exemplified by but not limited to Montana — mirrors the historic and legal oppression of Indian tribes and denies our shared potential to harness the power of sport to change the world. Teams and players from Indian reservations and tribal communities embody President Mandela’s notion of sports. Like the boys from Poplar or the Warrior Movement, these teams consistently play and represent themselves as if the game means more than wins and losses because, for them and for every school from a tribal community, it is more than just a game. Sport, especially basketball, is a central and unifying thread on many reservations where the competition and camaraderie echo many long-standing traditions and values. Beyond those echoes, teams from tribal schools also represent the continuing vitality of tribes as separate governments, cultures and people. Far from relics of history or chapters in textbooks, each fast break, three-pointer and state championship is another act of resistance in the centuries-long struggle to protect tribal political and cultural sovereignty. Indeed, teams from tribal schools and the way they’ve changed the game — a free-flowing “Rezball” style now emulated by the best NBA teams — is a small but meaningful representation of the broader Indigenous movement that adapts against, and within, the American legal and political structure imposed upon generations of tribal people. Like modern tribes innovating and succeeding in the current era of tribal self-determination, tribal hoops teams are the epitome of triumph over long odds, whether they win or lose. 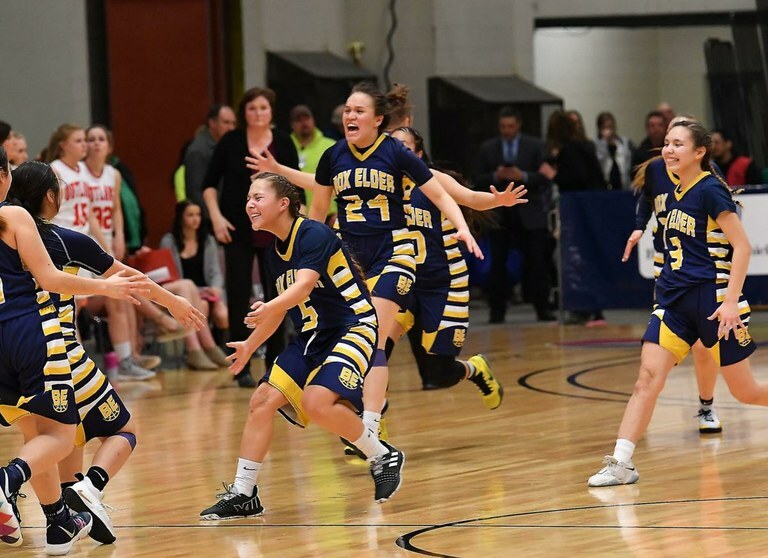 Box Elder celebrates winning its second consecutive Class C girls basketball championship on March 2, 2019 in Great Falls, Montana. And yet, rather than recognize and honor that triumph, teams from tribal communities instead face ongoing bigotry and discrimination. At this year’s state tournament, for example, representatives from the Montana High School Association (MHSA) refused to allow the team from Poplar to present the flag of the Assiniboine and Sioux Tribes of the Fort Peck Reservation along with the U.S. and Montana flags. According to the MHSA’s tournament handbook, “(o)ther groups can have their flag on the endline,” but only the U.S. and Montana flags can be honored at center court before each tournament session. Aside from the silent but clear discriminatory impact on tribes (what “other groups” have flags? ), this so-called guideline and its enforcement prevent the rightful representation of tribal nations as governments alongside their state and federal counterparts. Like every state and national flag, a tribe’s flag represents both its political sovereignty and its unique tribal values and identity. In recognition of the importance of that representation, a number of state governments and the U.S. Department of the Interior proudly display tribal flags every day. In addition to denigrating tribal status, individual student-athletes from tribal schools have also faced disrespect. Last year, Kendall Windy Boy, a star player from the Rocky Boys’ reservation, was deprived of his senior season for his home school. Having persevered through challenging childhood circumstances that left him behind his peers in school, including caring for his younger sister and living with a teammate and his coach, Kendall sought to play his last year of high school basketball despite having already turned 19 years old. The MHSA rules prohibit older students from participating but allow that prohibition to be waived in certain circumstances. Rather than honor Kendall’s triumph over unique circumstances and respect the importance of basketball as a way of life for him, his supporters and community, his waiver request was denied. Like the facially-neutral language and enforcement of the tournament handbook, this narrow-sighted decision rested only upon a superficially unbiased reading of the age rule while denying the meaningful legitimacy of tribal experience and perspective. Although blatant acts of anti-Indian racism are rightly and regularly condemned, the impacts of smaller, everyday incidents are often overlooked. But the effects of these decisions go well beyond the basketball courts of Montana; they work to support the ongoing and devastating legacy of tribal subjugation on the part of the United States. Continuing to (literally) sideline Indian tribes sustains historical biases demeaning the status, resilience and ongoing importance of tribes as sovereign governments. Marginalizing tribes and young tribal members, especially from a powerful place like the basketball court, also perpetuates a discriminatory power structure rooted in settler colonialism that pervades nearly every aspect of tribes’ legal existence. Such treatment, historically ignored or excused by the American legal system, belies our shared commitment to the tenets of equality and fairness. Those values are purportedly central to our national identity and at the very heart of sporting competition. Failing to consider that context, no matter the importance of the decision, whether in a court of law or on a basketball court, disparages those foundational ideals. While basketball alone won’t undo centuries of legal oppression, that history certainly affects the way in which modern Indian tribes and tribal members are able to play and succeed in the game. Despite that weight, the young men and women from tribal communities in Montana continue to show how sport has the power to change the world, unite us and inspire hope. They and their communities should be honored for doing so, and we should all find ways to embrace, not reject, the potential to learn and grow from their example. Monte Mills is a law professor and co-director of the Margery Hunter Brown Indian Law Clinic at the University of Montana in Missoula. Email High Country News at [email protected] or submit a letter to the editor.